The cold and rainy days are upon us already! I don’t know about you guys, but whenever these gloomy days approach, my hands get all itchy to “get my bake oooon~”. My fondest memories of baking would be sitting on the kitchen bench watching my mother get HER bake on. Watching her mix all the dry ingredients, and turning it into dough or a batter mixture. During all that time watching, the child in me was waiting dutifully for when my important job was up. Oh-so-eager when she would be scraping the bowl clean into little baking tins, hoping she doesn’t get too clean with the bowl or else I would be completely hopeless! ALAS, my turn, I get to lick the bowl clean! So, it is with my GREAT excitement to announce that we have a double pass to giveaway to one of you lucky readers!! Let me get into some little details on how awesome this show is going to be, because we are so excited (totally an understatement) for when we go on Sunday, 23rd March 2014. 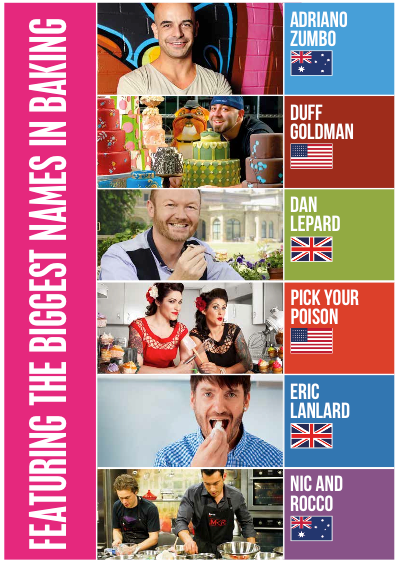 They’re going to have some pretty awesome baking stars from across the world come to demonstrate, entertain and blow your minds into the oven and back! So who are these peeps? I mean, that’s just the icing on top! There’s so much more where we can watch creations and magic happen! Julia Taylor (Masterchef), Nancy Ho (The Great Australian Bake Off), Kylie Millar (Masterchef), Anna Polyviou (head pastry chef at Shangri-La Hotel Sydney), and MORE! I can sit and keep going, but you obviously want to know how to GET these beautiful tickets that are in our hands!! 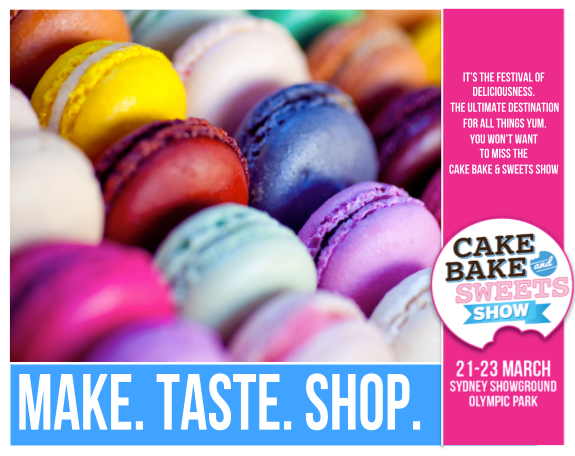 But seriously, remember to check out cake bake and sweets and also their facebook and/or twitter page for more information! SO HERE’S THE NITTY GRITTY DETAILS TO ENTER! Simply comment below on YOUR fondest or warmest or funniest … baking memory. Just anything that simply brings that silly, beautiful smile to your face, and we will put your name in a randomly selected draw to win these hot little passes!! Sponsored by Cake Bake and Sweets. When we had to make a cake quickly before we got to a party, we ended up having two teams in the family to see who could me the quickest and most presentable cake. Kitchen was a mess. Ill never forget the very first time my younger sister baked a cake by herself. It was a simple sponge and the look on her face as she pulled to piping hot cake out of the over was priceless....However, the rookie baker had baked the cake in a springform tin. Her look of delight quickly turned to that of sheer desperation as cake fell out of the tin into a crumbling mess on the floor. Safe to say she has never made that mistake again!! The first time I baked a strawberry shortcake was with four of my friends. Despite cooking in a tiny kitchen for for two people, we managed to assemble the cake, drenched in whipped cream and with strawberry stucked on in random places. Sure it was dry and looked like a prehistoric dinosaur with strawberry spikes, we still enjoyed it as we all had fun making the cake and smearing whipped cream on each other faces. when i was little i baked a sponge cake with my older brother to share with my family. we were working together so well through the entire process, with me reading the recipe and mixing while he added the ingredients. by the end we thought we had the perfect cake! but then it was time: tasting and judgement. everyone took a bite and almost immediately spat it right out. it was so salty! LOL ^^"
The first time I baked a proper cake was for my grandma's birthday. At the time me and my sister were craving for some cheesecakes, thus we decided upon making cheesecake. Like any normal first-timers, we used mr 'google' for help. Within minutes we got plenty of recipes options to choose from. After a long hard thinking, we picked the simplest recipe. We started working on it, following this 'ever' so simple recipe. However along the way, we probably lost track of the ingredients' measurements. At the end we decided to follow our 'instincts'. The thing is I am not a cake person, ive never baked cake n all, im more of the savoury food kind of person, with cake everything is unpredictable. Anyways we finished making it at the end, but we had to wait put it in the freezer overnight. God, the wait was just excruciating, I even had a dream about how the cheesecake would turn out. And I can safely say it was close to a nightmare. The next morning, me n my sis quickly went to the fridge to check on it. We took it out and decided to taste it first before we give it to our grandma. 'IVE NEVER TASTED A CHEESECAKE SO GOOD"
I put all the stuff in the mixer, but the dough became really soft and sticky which made it hard to handle. The dough had to be rested for 4 hours, so i tried taking the dough out and wrapping it.. but it got all over the freshly-mopped floor cause it was so sloppy. After that, the 4 hours were up, the recipe said to powder the benchtop with sugar so when i roll the dough on it, it would have a coating of sugar. I did that but the sugar went everywhere (as anyone but me would guess), and we had ants in the house for a week... yeah mum wasnt very happy.. When I was a kid, I used to make mud cakes. No, not chocolate cakes. Literal mud cakes. Made out of mud. Being the naïve child I was, I used to believe that if you made something look like food, it was edible. So, I made my mud cake, and handed it to my dad and told him to eat it. Out of kindness, he put a portion of it in his mouth and said that it tasted good. I was so happy, so I went out of the room, only to hear him having a coughing fit. Baking cookies. Fond memories of Mum letting me lick the beaters. Of course, would've been nicer if she'd have turned off the mixer first!!! The fondest memory that I have that relates to baking was the time when my friends and I decided to making macarons. Not just any macarons, but the temptingly indulgent raspberry and chocolate macarons from the Zumbaron kit. Creatively designed, 'easy to follow' and delicious, obviously. However, the 'easy to follow' factor became questionable, as we fastidious novice bakers, despite reading instructions an infinite number of times, could easily dismiss something as small as 1/4 cup of water as 1 cup. Oh, the joy, when the meringe overflowed, the unexpected miniture biscuit shapes, only to discover AFTER that we poured too much water. Well, we couldn't stop laughing at our careless error, and since we perfected the chocolate filling, it wasn't that bad at all. Rather, the happiness that we produced from such flawed creation transformed into a cherished memory, full of warmth and joy on that rainy day. This was actually not too long ago. I made a massive french vanilla cheesecake for my friend's birthday, and it was my first time using gelatine. I had assumed that you just melt it with water, throw it in the batter and let it to set. Come aorund to my friend's birthday, all this pressure on me for making the cake .. When the cake was cut, someone commented " Why is there a plastic bag inside the cake " …… TURNS OUT, the gelatine DID NOT mix properly so there was a "clear jelly" part in the middle of my cake . Their favourite muffin, of berries blue. One bite, two bites, oh he eats it so slow. They're the best of the bunch! Are they delicious like you had tasked? Went through hardship and great strife. They're so delicious there's nothing to hate! Tell me what else is there in store? The bubble of dream, well it pops. In the end they've gone to waste. Never again, to experience like before. The kitchen aroma, now so estranged. To an Viet couple I'm told. No father smiling despite searing heat. A shame, oh for god's sake. Like my parent's, I'll bake. My soul. Memories are special, we treasure them. Ok, I'll tell you a special experience I had. Sweetness, the spiritual passion, the seductive art of baking. Baking is certainly something I will confess to have undervalued. I'm not a baker, I certainly have no intention to bake. But my father was a baker, and a damn good one at that. His kitchen still remains vivid in my imagination. Whether it be the quiet afternoons where frozen pastry had been shaped or the bustling vivacity of the night where workers ran around like madmen hurrying to ensure everything went to plan. The magic happened within that kitchen, and come morning, hundreds of cakes would line up across the table, some to be packaged and others to be displayed at the cafe front. One or two cakes, I might have had. Not bad, not bad. But I was quite sick of them to be honest; never really had a sweet tooth. "Oh my gosh, you have a cake store?" my friends would beam. "That is so awesome!" "Yeah, yeah," I would say. "Nothing so special." It is only now, that I have come to realise the absolute privilege of where I was at. Of course, nothing can change now that the deed is done, but this has given me a newfound appreciation of the bakery. Now, the sweet sweet flavours, the aroma of the kitchen, my cheeky attempts to nick a slice from the back remain only in my head, in my memories. No more cakes for free, which in the end turned out to be a shame when I thought deeply about what was slowly saying goodbye. I guess the old adage is true; you never really appreciate something until you lose it. But I draw one silver lining from the severance of my connection with the cake store-it has truly allowed me to appreciate the beauty of what you have, and the enrichment of memories of what you don't have anymore. I may never have fancied too many cakes, but one thing I can tell you, I'll miss that place. An awesome idea hit me during a typical cooking class: I should create a rainbow cake! prepared immediately the main ingredients: a fruit for each colour. They would all each have their own layer, stacked, then baked all at once. Other things were prepared really quickly in this exhilarating moment (eg oil, sugar, flour). That would be my demise. Turns out I had mistaken my one cup of sugar for one cup of bicarbonate. The cake, which was meant to fit on a plate, was large enough to fill an entire garbage bag. The cake could still be eaten, but it's taste was extremely salty. The cooking teacher would then remember me as "the kid who made the abomination". It was that day I pledged to be an awesome cook, and that has brought me far.